To gain insight into the world of modern communications, the Chester County Library in Exton is inviting the public to a presentation on Monday, Jan. 6, in the Struble Room. From 7 to 8:30 p.m., Dr. Rocco Leonard Martino, the inventor of the original smartphone, will present “Personal History of the Computer,” a discussion of the history and future of computers. Martino, who has worked for more than 60 years in the fields of technology and science, received his doctorate in astrophysics at the University of Toronto and is one of the leading experts on the history of the computer. 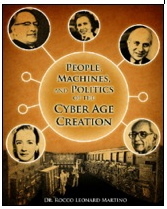 He is also the author of several books, including People, Machines, & Politics of the Cyber Age. Born in Toronto, Canada, Martino immigrated to the U. S. in 1962 and currently makes his home in Pennsylvania, where he is a member of the Overbrook Golf Club, the Union League of Philadelphia, and the Sea Isle City Yacht Club. An avid sailor and a past commodore and board member of the Yacht Club, he served as commodore of the Mid-Atlantic Yacht Racing Association from 1979-1981, and secretary from 1981-1988. For more information on programs at the Chester County Library, visit http://www.ccls.org.